I was preparing food in the concessions stand for the girl's volleyball. It was crazy busy and we were a man down. I have to say we were a little unprepared. One of the girl's from the team came out and said "Mrs. Spoor, you are needed out on the court." I washed my hands and walked into the gym. Our principal was talking about Down syndrome. I did not think too much of it since we were having a Dig 4 Down syndrome night. Catching me completely off guard, I heard, Mrs. Spoor and Lydia would you come to the center of the court? I scooped up Lydia and off we went. They were honoring Lydia. The senior from the volleyball team came out and gave Lydia a rose. She smiled and cheered with delight. She went to the principal to get closer to the microphone. Typically, when given a chance, she will sing and chat away into the microphone. Not this time. However, when the principal said it was time to play volleyball, she raised her rose above her head and shook it and giggled again. It was a true humbling experience that the entire school would honor this little girl. That this little girl was so loved and respected. 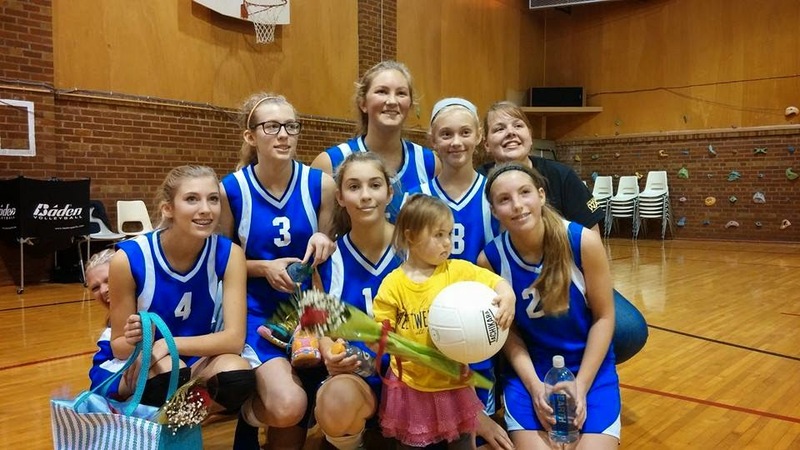 That the volleyball team would want to raise awareness and money for Down syndrome. A couple months ago the coach of the volleyball team had this great idea of doing Dig 4 Down syndrome. I know that a lot of teams wear pink for Breast Cancer Awareness, however, that does not personally affect anyone at the school. It also seems to be a bit of a fad. It is amazing to raise so much awareness. But for me, Down syndrome is personal, it affects my family. We participate in the Down syndrome awareness walk (we even did two this year) and I write about Down syndrome and I have a Facebook page highlighting Lydia's achievements. I never imagined that our school would want to create awareness too! A couple years ago, upon returning from our prolonged experience in the hospital with Lydia, we knew that private school was the best option for our family. There are several reasons why, but having an education that is Christ-centered was very important. We searched high and low for a school that we could financially afford (we had some other kids coming up on the horizion) and we wanted a school that would take Lydia. After touring many schools, we found one that felt like home. It was a bonus too that they were willing to take Lydia. And they were not just willing to take her, they wanted her there. We keep evaluating how well she is doing and if this will work out, but so far, so good. I do think that it makes all of the difference that Lydia is with her sisters, she knows she is in a place where she is wanted, and her disability is not center stage. The bar is set high and she is rising to it. They understand her strengths and capitalize on that. I can't say enough about this wonderful school. Such an amazing thing that they have done for our family and especially for Lydia. I think that it is great that the coach recognized that Down syndrome is something that directly impacts these students and chose to highlight that! We were able to put up facts all around to educate others about Down syndrome. We were able to sell T-Shirts to continue to create awareness about Down syndrome and we were able to expose a lot of people to Down syndrome. The best way to create awareness is to face it head on. Lydia walked around giving high fives, smiling and giggling. It take a moment for her to capture your heart, having you smile and realizing that she is more alike than different. As a team, a school, and a community, there was a lot of money raised. It will go towards a local Down syndrome chapter where all of the money stays and supports families like ours. That money will give back to the community, help families out and make a real impact. What a great idea to show the volleyball team the importance of serving others, having fun, and helping others out. It was a win all the way around. Full inclusion is an important thing. We are so blessed that Lydia is where she is at. We are even more blessed that our school rallies behind her and is not afraid to show her support. I have to say that being part of this event was very humbling and really gave me encouragement. Inclusion is important for everyone and makes all students better. These lessons are ones that cannot be taught, they must be learned. What a great thing for all involved! We are in the right place. Thanks Trinity Baptist School for all of your support and love for Lydia. Thank you to Miss Leeds for the great idea and implementation for Dig 4 Down syndrome. Thank you Mr. Shaeffer for your support and encouragement to everyone. 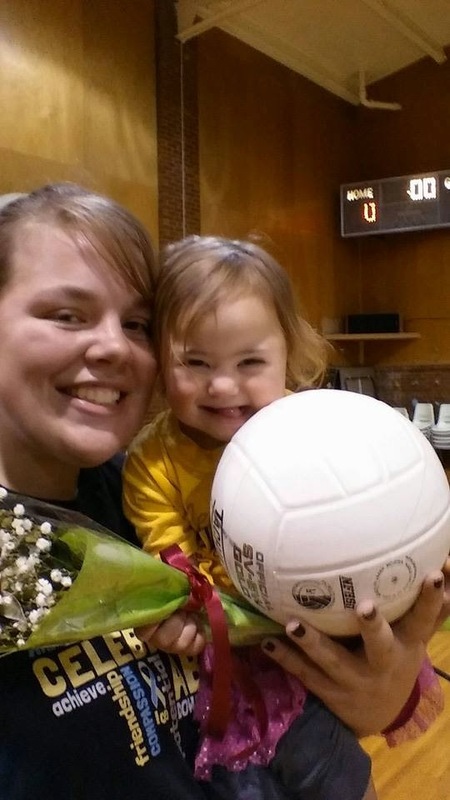 And thank you to the volleyball team for playing a very hard fought battle and loving Lydia! Way to go Patriots! It is October 10. 10 days into Down syndrome awareness month. This is my first post. Last year I blogged every day for 31 days (31 for 21). I have seen my Facebook page lit up with posts about Down syndrome. Something has stopped me from writing, from posting a whole lot (I am sure I still post quite a bit). I enjoy seeing the posts and I really want to educate and make a difference. However, after my last encounter of feeling as though I needed to defend why I had my daughter, I have paused to reflect. I have read the comments as my blog was shared and people weighed in. I was not offended, we all have our own opinion. I just took time to reflect. I asked myself if I did the right thing by walking away or should I have educated the person? For me, the right thing was to walk away. I don't have to defend why I had Lydia and I don't have to force her upon people. I have understood that my words will not change everyone's opinions or behaviors, and I am OK with that. But I also recognize that I don't have to be in a situation where I have to hear demeaning comments about my daughter, walking away with a smile I think sends a loud enough message for me! And in the past couple of weeks, I have seen my daughter do the unthinkable and become very ill. This is the life we live, this is who she is. We have reached the 3 year post op anniversary of her surgery that connected her, that allowed her to eat. On that same day she preformed in front of many grandparents for the very first time. She is completely inclusive in the private school that our other girls attend. There were times that I never thought that they would all be together, much less all sing together. I did everything I could to choke back the tears. She was amazing (if you want to see the video you can go to www.facebook.com/teamlydibug). I was told she would never amount to anything and she should be institutionalized. She did better than most of her peers (speech or no speech), she put her whole heart into it and it was great! My miracle! And later that night Lydia fell ill. While she did not have to make a return appearance to the hospital, I am pretty sure that this is the worse she ever looked. She lost a lot of weight and when she looked me in the eye, the illness had stolen her twinkle. It is exhausting rocking a sick child, wondering if she will make it through, and putting all of your needs aside for your child. However, when the twinkle starts to come back, it is a huge celebration! There is nothing that can describe that feeling. I have been looking at the posts and seeing all of these cuties who rock a little extra. See, in my mind, I can't begin to understand why people think that Lydia's life is less than the next person. I can't begin to wrap my mind around why people think they can determine life based on a label (because after all, a diagnosis is just a label, it can't describe the person either). I know you have heard it before, what if we all came with a prenatal label that would tell us what we would do in life. What if I knew that I was going to get breast cancer, would my life be less valuable because I would incur medical bills and I would have to fight to stay alive, I would have ongoing medical needs? Absurd! What difference does it make if a person is born sick or gets sick during the course of their life? I have come to realize that those labels help shape us to become the people we are today. And those labels certainly cannot determine the quality of life, the kind of person they will be, or really anything about that person. As Lydia put a challenge out, educate yourself and get to know someone with Down syndrome, I would like to challenge you to that as well. Our fears and preconceptions rob us from blessings. Think back to high school and that heart throb. What kept you from asking him out? What kept you from that cute "nerd" who sat in the front of the classroom? Those labels, I am sure, do not define who they are today? Down syndrome is not the first defect that has a label. There are all kinds of things in society that have labels. Some are good and some are bad. We must first get to know the person. We must first be educated on things. It is only then we can understand the blessing we are missing. 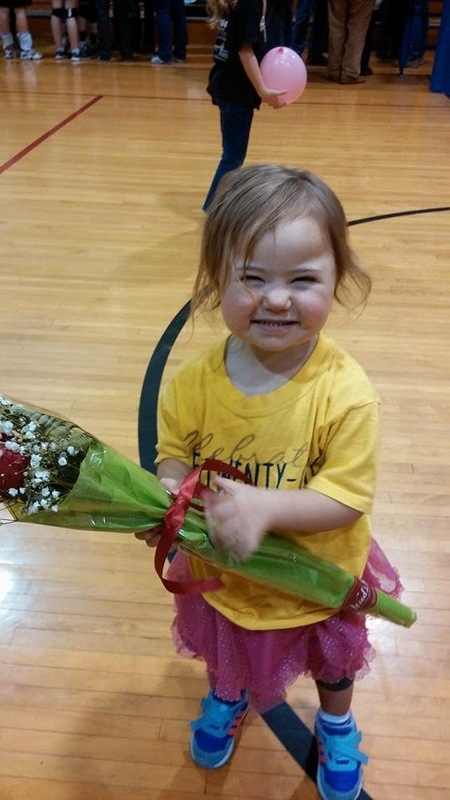 There are a lot of wrong facts out there about Down syndrome. The only way you will know the entire story is to get to know the person. Maybe that is one of the biggest blessings that I have learned on this journey. I have learned to look past the things that society says are not socially acceptable. It is only then I can have some of the best friendships and relationships. My children are better girls because they know how to look past the labels. They get to know people for who they are on the inside. Labels inform us, they do not define us. Just as my title on this blog is generic, the message is too! I think this is what we all hope for as parents. Get to know my kid and accept them for who they are. In Lydia's case part of her is Down syndrome and medical issues. However, most of her is love, goofiness, determination, friendship, caring, giving, and making others laugh. There is so much about her that Down syndrome cannot describe. 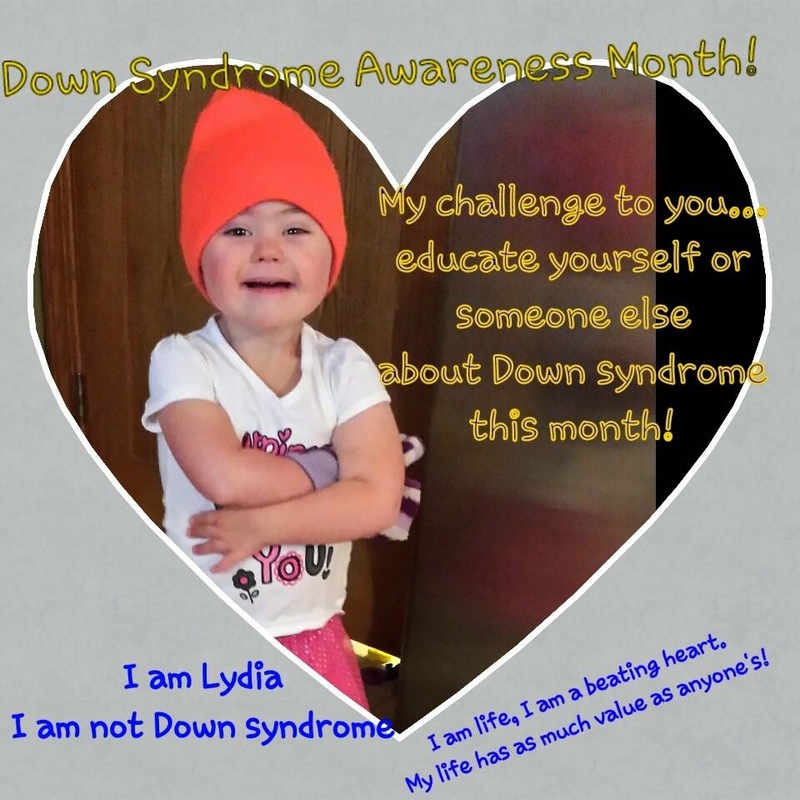 For Down syndrome awareness month, Lydia's challenge is to educate yourself and get to know someone with Down syndrome. It will change you for the better, it will change our communities, and it will reduce the number of times that parents have to defend why they chose life for their child with Down syndrome. I know not everyone will accept the challenge, will have the same opinions as me, but if we can respect one another by being educated, we are on a great step forward!